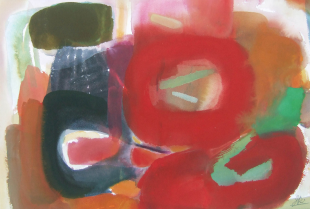 Jenny is an established international artist specialising in works on paper. She was elected as a member of the Royal Birmingham Society of Artists in 2011. She graduated with an MA in Fine Art from Edinburgh University and enjoyed an early career in botanical illustration working in association with the Royal Botanic Gardens, Edinburgh University and Cardiff University. Her abstract work is inspired by music; while her semi abstract landscapes draw on colour and symbolism. Both allow her to explore the highly versatile watercolour medium, experimenting with techniques and methods of expression. She has exhibited work throughout the UK and in Santa Fe, USA and has work in several public collections. If you would like a half price entry ticket then email us at bill@bridgegategallery.co.uk or visit www.affordableartfair.com and click on the BUY TICKETS page and use the code BRIDGEGATEHP to receive the discount. Please note a small booking fee applies to half price tickets.